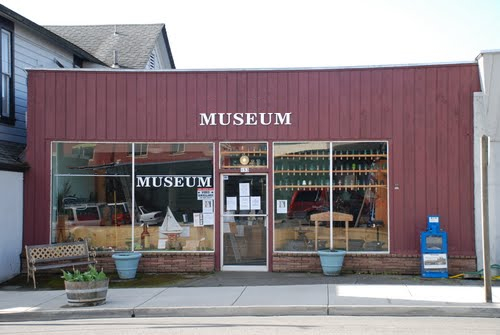 This unassuming building does not appear to be a museum save for the white letters in one of the windows stating "Museum" that gives it away. The red wooden paneling on the outside of the building gives way only to four large pane glass windows. A wooden bench at the front provides seating, and a newspaper vending machine gives out free penny savers to those passing by. The front door to the building has a few fliers inside, announcing future exhibits, and other events happening in the city. The building itself is one story tall, and not very large at all. Wooden shelves and glass display cases show off the pride and history of Mythic Wood. Displays in the cases go from Native American artifacts to Old West machinery and many different other items that are unique to the area. The whole of the museum is quiet, no music playing and when people are inside you can hear their quiet whispers. The low ceiling gives off fluorescent lighting throughout the entire single room, mixing with the light coming in through the windows. Only a back office, and a set of stairs leading to the basement where the safe and the storage area is are off-limits to the general public.